It’s always the same with every email campaign. If you’re an email marketer, you’ll know this feeling very well. It’s an on-going quest to look for the best ways to frame the message in our emails that encourage recipients to take the right action. One popular concept at present is to use videos in emails. Whether it’s a product demonstration video, a tutorial, a customer testimonial or even a promotion – you know that videos can really grab the attention of your recipients. 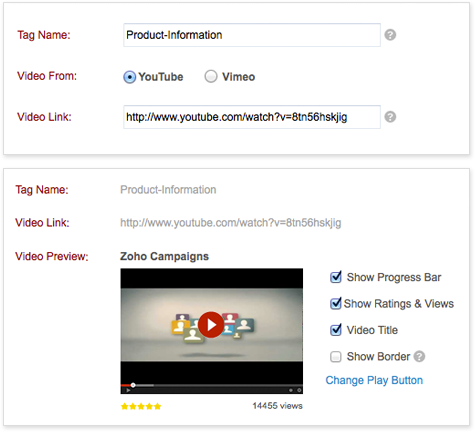 You can now link to YouTube and Vimeo videos in Zoho Campaigns with Media Tags. All you need to do is to create a customized merge tag for every video that you want to link. These video merge tags will then be available under the merge tags list while you’re creating an email campaign. Here’s the complete guide to going about using these media tags. Our brains process visuals faster than text. Effective videos grab your recipient’s attention almost instantly, and this also tends to increase conversions from your emails. So visuals are processed 60,000 times faster than text, graphics quickly affect our emotions, and our emotions greatly affect our decision-making. Your videos complement the text content that you have created. Let’s say you’re sending out Monthly Product Updates to your customers. A demo video will give the finer details, without overwhelming your customers with too much content in the email itself! Your recipients will definitely want to share good videos that capture their attention – with colleagues, friends and on social media, which get shared further. While using these video merge tags from Zoho Campaigns, you do not have to worry about an increase in the email size. These videos will not play directly within your email. They will be opened in a new tab. Your recipient will only see a screenshot of the video in the email, with the play button shown too. As for tracking, Zoho Campaigns tracks them just like any link in your email. The Link Click Activity under Reports gives you all the details. You can also use Google Analytics to track these link clicks. So, how many of you use videos as a part of your email marketing efforts? And have you seen changes in your conversion rates? Do let us know in comments below. Video can really help save your time. You don’t need to explain again and again to different client. And I believe video is more preferred by user because they can watch it over again if they did not understand the first time they watch it. Good information! It’s encouraging to see efforts to make video marketing more user-friendly for email campaigns. Thanks, @Randall! How have been your experiences with video email marketing? Do add your thoughts too. Thanks a lot, @IRSmartt:disqus . Do let us know how your email campaigns with videos perform. Looks awesome. Now I can send the webinar recording mail to the registrants in the mailer itself.